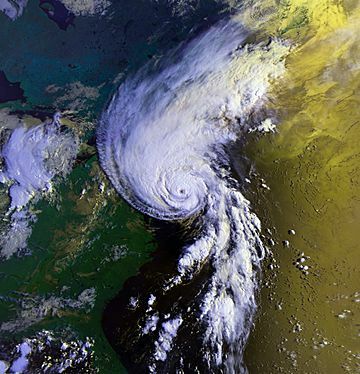 Hurricane Bob struck North Carolina and southeast New England during August 1991. It was caused by a tropical depression in the Bahamas, which came inland and turned into a hurricane. Bob took 18 lives, injured 190 and created $1.5 billion in damage. The storm was one of the worst hurricanes to impact the New England during the 20th Century, the 1938 hurricane being the worst of them. Bob was strong for a Category 3 hurricane. Hurricane Bob Facts for Kids. Kiddle Encyclopedia.